Lessons are assignments that consist of multiple pages with one question per page. 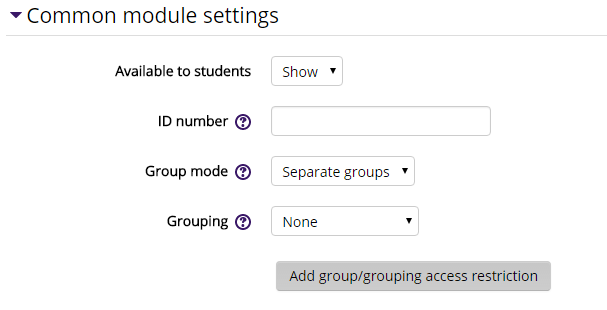 The questions can be manually entered into Moodle, or can be uploaded from a text file that follows one of the acceptable question formats. For instructions on lessons, see Add a Lesson and Setting Up a Lesson. In the General settings, the instructor can designate a title and provide a description or instructions for the lesson. Linked media: Instructors can upload a file to be used in the lesson. A "Click here to view" link will appear on each page of the lesson. Progress bar: If enabled, students will see their progress throughout the lesson. Display ongoing score: If enabled, each page in the lesson will display the student's current points out of the total possible thus far. Dispaly menu: If enabled, a navigation menu will be displayed, which will allow students to jump through the list of pages. Minimum grade to display menu: This setting determines whether a student must obtain a certain grade before viewing the lesson menu. This forces the student to go through the entire lesson on their first attempt, then after obtaining the required grade they can use the menu for review. Slideshow: If enabled, the lesson is displayed as a slideshow, with a fixed width and height. Maximum number of answers: This setting specifies the maximum number of answers that may be used in the lesson. If only true/false questions are used, it can be set to 2. The setting may be changed at any time, since it only affects what the teacher sees, not the data. Use default feedback: If enabled, when a response is not found for a particular question, the default response of "That's the correct answer" or "That's the wrong answer" will be shown. Link to next activity: To provide a link at the end of the lesson to another activity in the course, select the activity from the dropdown list. If enabled, the Availability settings allow an instructor to specify the timeframe in which a student can access and participate in the lesson activity. The instructor can also set a time limit for an attempt. Note that the time uses the 24-hour clock. Provide option to try a question again: If enabled, when a question is answered incorrectly, the student is given the option to try it again for no point credit, or continue with the lesson. Maximum number of attempts: An instructor can choose to allow up to 10 attempts for each question. Number of pages to show: This setting specifies the number of pages shown in a lesson. It is only applicable for lessons with pages shown in a random order (when "Action after correct answer" is set to "Show an unseen page" or "Show an unanswered page"). If set to zero, then all pages are shown. 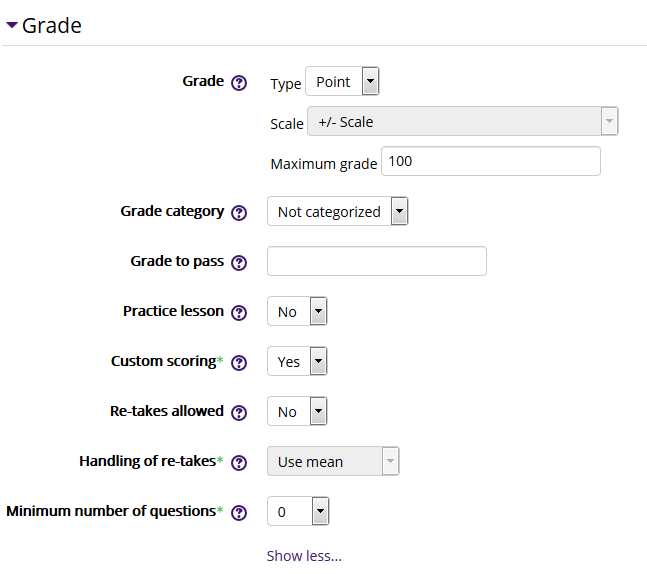 In the Grade tab, you can change the settings of how the students will be graded for the lesson. Under 'Type', if "None" is selected, the lesson will not be added to the gradebook. Although there is an option to use a Scale, it is best to use a Point system. Below is a brief description of each option. 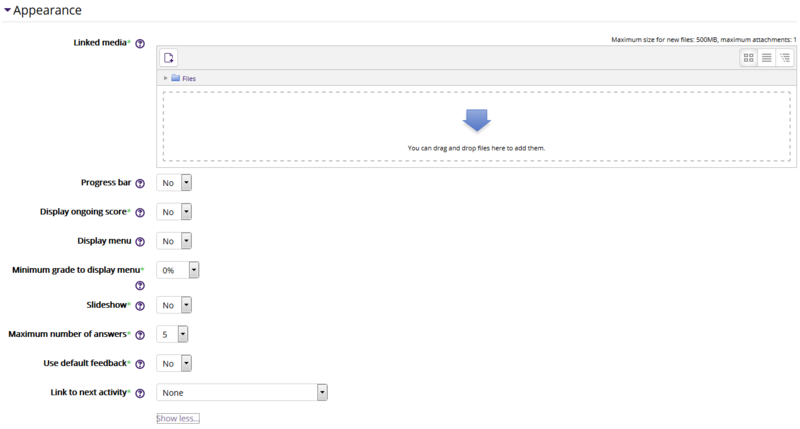 To change these features, use the drop down boxes next to each individual feature. Grade Type: It is recommended that instructors choose either "None" (eliminating the activity from the gradebook) or "Point" and setting a maximum grade. Scale is NOT recommended. Practice lesson: A practice lesson does not appear in the gradebook. Custom scoring: If enabled, then each answer may be given a numerical point value (positive or negative). Re-takes allowed: If enabled, students can attempt the lesson more than once. Handling of re-takes: If re-takes are allowed, this setting specifies whether the grade for the lesson is the mean or maximum of all attempts. Minimum number of questions: This setting specifies the minimum number of questions that will be used to calculate a grade for the activity. The Lesson can be restricted based upon a date, group, activity completion of another activity/resource in the course, etc. NOTE: If more than one restriction is added, students must meet EACH of the requirements before the lesson becomes available. By default, students can manually mark the lesson as complete, but an instructor can change this to be required. If required, the students can be marked complete by viewing the lesson, receiving a grade, reach the end of the lesson page, or participate in the lesson for a minimum of time.